As usual the catch with data stemming from consumer speedtests is that it ends up being more a reflection of those who use the tester and thus general service take-up (popularity), rather than raw network availability. 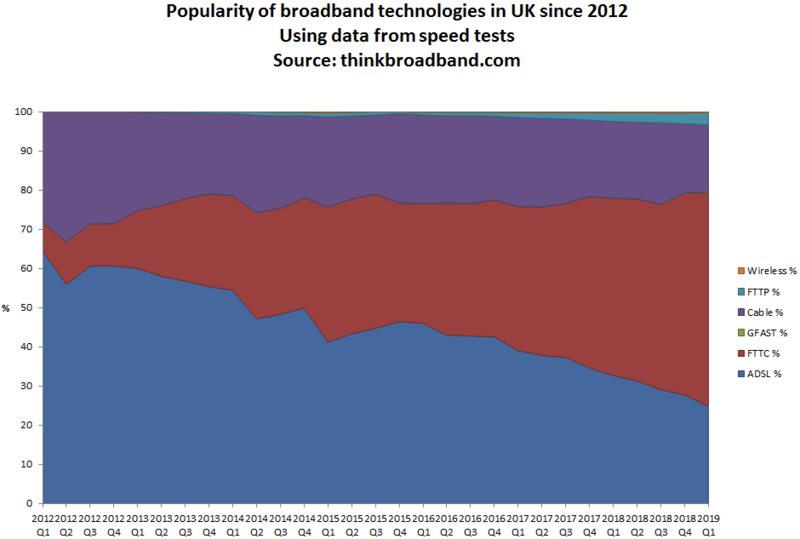 The new results from Thinkbroadband thus find that the Q1 2019 technology split for the UK is 24.8% using ADSL/ADSL2+, FTTC (54.5%), G.fast (0.1%), Cable (17.2%), FTTP (3.1%) and wireless (0.3%). By comparison the actual network availability figures are radically different. For example, ADSL is nearly universal in its UK coverage, while “full fibre” FTTP networks are available to 6.72% of premises, some 5.49% can get G.fast (early roll-out phase), Cable (DOCSIS) is on 46.06% and FTTC (VDSL2) must be a few points north of the 90% mark. Similarly it’s worth noting that the figures shown below seem to be proportional and thus won’t be very reflective of take-up in terms of pure volume. You can see this by looking at the result for cable networks, which seem to be falling but this doesn’t tell the whole story. For example, at the end of 2012 we know that UK cable networks (e.g. Virgin Media, WightFibre) had a total broadband customer base of roughly 4.3 million but toward the end of 2018 this had grown to 5.3 million (the chart below can’t show this), yet the overall total of broadband users (all technologies) has increased at a faster rate. Over the same period Virgin alone also added around 1.6 million+ premises to their network coverage. Despite the caveats this is still a useful chart for showing how the popularity of different broadband technologies has changed and continues to change. 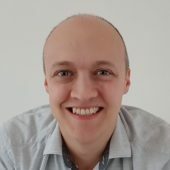 In particular Fibre-to-the-Cabinet (FTTC / VDSL2) networks are starting to reach near universal coverage and over the next few years they may decline as users upgrade to ultrafast services (G.fast, FTTP and Cable). Meanwhile ADSL is slowly heading toward the end of its life. One big unknown above is how future 5G Mobile services might change this picture. 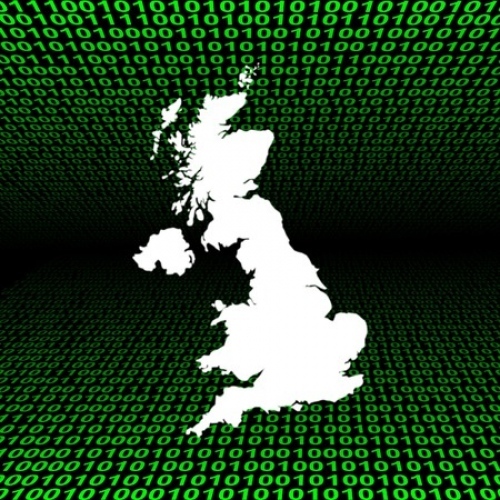 More than a few analysts are predicting that 5G could become an even more viable alternative to fixed line broadband in some parts of the UK (i.e. more so than 4G ever was) and some operators, such as Three UK, are clearly planning products to do just that. We won’t see the outcome of such a battle for awhile but it’s an interesting possibility. Finally, Satellite connections don’t appear to have been included above but then we suspect that their customer figures / data sample size would be so small as to be statistically insignificant on such a chart (below even G.fast).